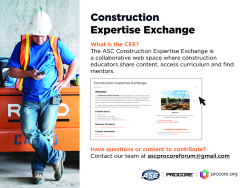 Click to Search ASC Proceedings – ASC Proceedings (1987-2013) and the Journal of Construction Education (1996-2004) searchable. ASC institutional members receive the International Journal of Construction Education and Research at 40% off the full rate. In order to purchase the journal at the discounted rate, ASC members should click on the following link. To browse Journal Content or Subscribe to IJCER Click here.